A new medical study suggests that side effects of Pradaxa, a new blood thinner, may increase the risk of bleeding events even more than warfarin, the drug it was designed to replace. Kansas researchers tested the use of Pradaxa during radiofrequency ablation of atrial fibrillation and discovered more than double the number of bleeding problems with Pradaxa, when compared to those seen when warfarin was used. In a study was published in the Journal of the American College of Cardiology. Pradaxa (dabigatran) is under increased scrutiny from federal health regulators. A large number of post-marketing reports involving severe bleeding events and deaths are reported with Pradaxa. Pradaxa was introduced by Boehringer Ingelheim in October 2010, as an alternative to Coumadin (warfarin) for prevention of strokes among patients with atrial fibrillation. The drug was heavily marketed as superior to warfarin, because it is easier to use and requires less monitoring. When serious bleeding events do occur, warfarin can be quickly counteracted by doses of Vitamin K or fresh frozen plasma infusions. There is no such quick fix for bleeding with Pradaxa. 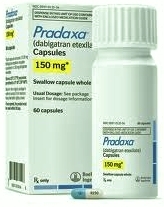 According to a report by the Institute for Safe Medication Practices in January 2012, more episodes of hemorrhages with Pradaxa were reported to the FDA’s Adverse Event Reporting System during the first quarter of 2011 than were reported in association with any other drug monitored by the group. At least 505 episodes involving Pradaxa bleeding were reported, compared to 176 cases reported with warfarin, which was second on the list. A number of patients throughout the United States who have experienced severe bleeding problems are considering a potential Pradaxa lawsuit against Boehringer Ingelheim for failing to adequately research their medication or warn about the risk of internal bleeding.